Master Marf: Atheism, Christianity and... Toast? 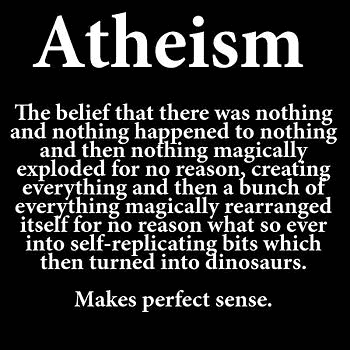 The belief that there was nothing and nothing happened to nothing and then nothing magically exploded for no reason, creating everything and then a bunch of everything magically rearranged itself for no reason what so ever into self-replicating bits which then turned into dinosaurs. 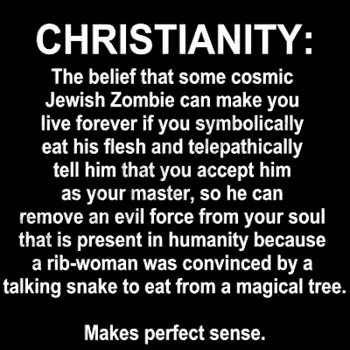 The belief that some cosmic Jewish Zombie can make you live forever if you symbolically eat his flesh and telepathically tell him that you accept him as your master, so he can remove an evil force from your soul that is present in humanity because a rib-woman was convinced by a talking snake to eat from a magical tree. 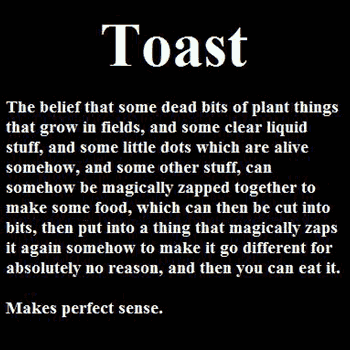 The belief that some dead bits of plant things that grow in fields, and some clear liquid stuff, and some little dots which are alive somehow, and some other stuff, can somehow be magically zapped together to make some food, which can then be cut into bits, then put into a thing that magically zaps it again somehow to make it go different for absolutely no reason, and then you can eat it. An informal fallacy based on misrepresentation of an opponent's position. 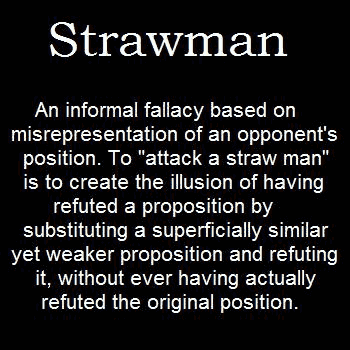 To "attack a straw man" is to create the illusion of having refuted a proposition by substituting a superficially similar yet weaker proposition and refuting it, without ever having actually refuted the original position. That actually does make perfect sense. The belief that some 20-something-year-old from a totem-pole-town in Alaska was bored enough to make a blog, that despite being about nothing has somehow lasted two and a half years, and that he has enough work ethic to not miss a single day of posting. The toast one fails hard. "that are alive somehow" "plant things" "little dots" "absolutely no reason"
That... is kinda the point. A funny but a honest article. It's what happens always when religion is discussed in the net.